Just watched it. Amazing. Too bad we have to wait a week for part two. Paige's response to Pavel's...advances was hilarious and Beck's probably going to beat himself up for falling for that taser thing again. I still think Tron's injuries are going to semi-incapacitate him, and Beck's going to have to save him and he's going to get hurt doing it and Tron's going to blame himself. I was on the edge of my seat during every flashback. For those of you who want to know, Scars - Part 1 is out on iTunes. excellent episode, can't wait to see part 2. Downloading it now from the Playstation store. Last night I watched it twice over at HooDooMan's since he has X D. We started last week having Tron Uprising Viewing parties do we could watch it then geek out and discuss it all after. So much fun. Why did they changed Flynn's face?! This episode was AWESOME! Yeah, BanditTron and I had a great time watching TRON: Uprising, it's now become a weekly TRON party! 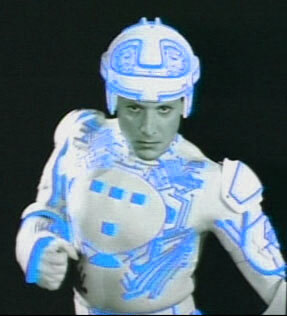 We even watched some classic 1982 TRON on Blu-ray last night! Great fun! BanditTron Wrote:Even discovered a small Easter Egg on Tron's lightcycle. Is it the 0.82 on the side? This was such an awsome episode! I can't wait for part II.. So does this mean that since CLU can heal programs, he would heal TRON before turning him into Rinzler??? And what we saw in T:L, was that CLU derezzing TRON's chest? I interpruted Dyson's healed face to mean that Clu had possibly "rectified" him. Ok, BanditTron....don't keep us in suspense, what's the Easter Egg? My TV schedule shows Scars II this Friday and "Grounded" one week later 11/09, so maybe we are getting all the known episodes this season. Rangerknight Wrote:Why did they changed Flynn's face?! They both look fine to me, though I do personally like the first one better. My guess is because the first one is 1983 Flynn and the second one is 1989 Flynn. 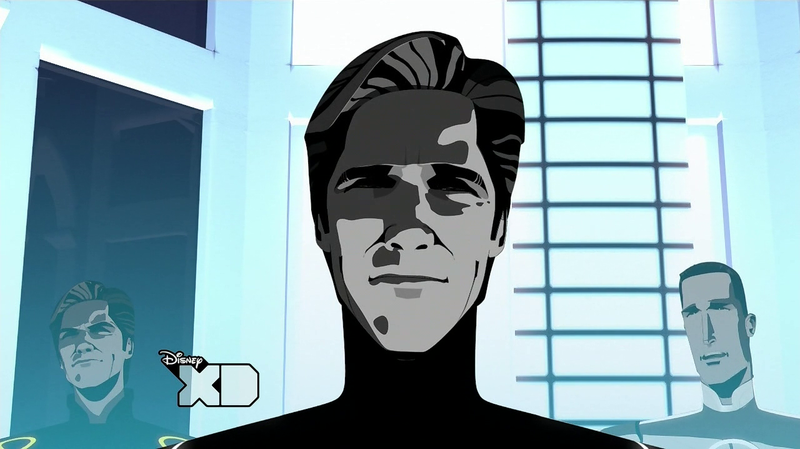 Also, was that Flynn's/CLU's voice actor from Tron Evolution and Beck's Beginning again? They both sounded much more like Jeff Bridges in this episode. I'm wondering they hired a new art director to change the style a bit OR they used Bridge's famous Space Paranoid shot as reference in '82 where he's in the arcade staring out at the audience, with the crowd behind him. It's a famous shot of "It's all in the wrists!" ISOlatedThinker Wrote:This was such an awsome episode! I can't wait for part II.. So does this mean that since CLU can heal programs, he would heal TRON before turning him into Rinzler??? And what we saw in T:L, was that CLU derezzing TRON's chest? BINGO. That's how he entraps TRON. ShadowDragon1 Wrote:I interpruted Dyson's healed face to mean that Clu had possibly "rectified" him. I don't think so. Dyson is either: 1) a mole to spy on TRON the whole time or 2) CLU struck a deal with Dyson in exchange for inside info. CLU is a sneaky one, remember that. He sent Dyson to 'shake' Tron out of Argon City because he 'hears otherwise'. ...it seems that Dyson tries to fix Tron himself in order to bring the mighty hero to Clu's point of view. 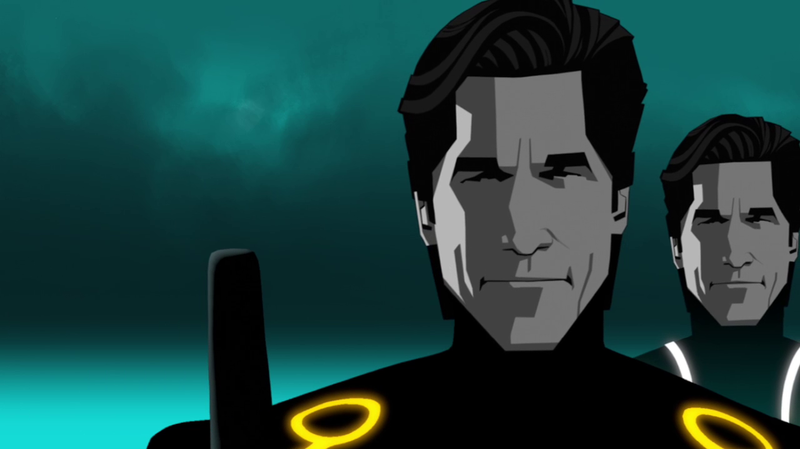 Tron escapes before Dyson can finish the process, so Tron has to manage with his scars, both literal and metaphorical. I guess we will see the result of that in next week's episode! Yep, I loved this episode, definitely the best of the season. I especially love CLU's plan.